I have this tooth whistle. One of my teeth, maybe it’s two… in combination with my tongue and the letter ‘s’… it whistles. That’s a weird way to start a cookie recipe. With a tooth whistle. It’s an elusive whistle. It arrives unexpectedly with the sound of an ‘s’, just every few months. One short whistle and it’s gone again only to surprise with its presence months later. Something about the stars aligning just so. I’m always delighted by its presence. Like I’m part bird and party fairy for just half a second. I think so hard about what I’m trying to say that when part of it comes out as a whistle… well that’s just a bonus. I know it’s just a tooth whistle. But I’ve come to cherish it. I mention my tooth whistle today for two reasons, because… I was thinking about it, and that’s how this whole blog things works. You have to endure banal stories about my teeth in order to get the very best cookie recipes. But also… a truly stellar, gooey, delicious, addictive, PERFECT cookie recipe is as elusive and delightful as a tooth whistle. The stars have aligned and our cookie is here. These cookies come from the brilliant sweet-treat mind of Graham Blackall. You know Graham from the blog Glazed and Confused, or perhaps his King Cake French Fries. Lordy. I like the way he thinks. These Chocolate Chip Cookies aren’t just chocolate chip cookies. They’re tender, moist, and divinely rich thanks, in part, to butter and cream cheese. Softened very well and stirred together until glossy smooth. A cookie isn’t a cookie without brown sugar. One egg, for binding for glue. In addition to the usual (dry ingredient) suspects: flour, salt, and leavening… we also have MILK POWDER! Adding milk powder to cookies makes them more, whats the best word, lavish. Like decorating an already lovely room with velvet. Besides, Christina Tosi does it and so should we. Stir the dry into wet. You may find that the milk powder is a bit lumpy. Keep stirring. Stir some more. And the lumps and bumps will absorb and subside after resting in the fridge. Crumbled Oreo cookies and milk chocolate chips! Because we’re bold and a little bit ridiculous. Graham uses white chocolate instead of milk chocolate in these cookies. The trick with white chocolate: make sure it’s actually white chocolate and not oils and sugar passing as white chocolate. A block of chocolate is better than chips. Don’t taste it. Don’t even start down that road. I’m telling you… don’t. After the dough rests in the refrigerator for an hour (or even overnight), dough balls are scooped. Generous scoops. They might as well be big cookies. Crisp on the outside. Gooey on the inside. Oreo-studded. Melted milk chocolate. Creamy. Rich. Completely over the top. We all owe Graham a high-five. Maybe a double. In the bowl of stand mixer fitted with the paddle attachment, beat together the cream cheese and butter until light and creamy, about a minute. Make sure that both the cream cheese and butter are very well softened to avoid any lumps. Add the brown sugar and egg and beat on medium-low speed for 3 minutes until pale and fluffy. Beat in vanilla. In a medium bowl whisk together flour, milk powder, baking soda, baking powder, and salt until well combined. Add in the dry ingredients and mix until combined. Fold in the chopped Oreos and milk chocolate chips. Wrap the dough in plastic wrap (or cover the bowl in plastic wrap) and refrigerate for at least 1 hours, or overnight. Place a rack in the center and upper third of the oven and preheat oven to 350F. Line a baking sheet with parchment paper. Spoon out dough balls, a heaping 2 tablespoons of dough for each cookie. Place on the prepared baking sheets, providing at least 1 1/2 inches between each cookies. Bake the cookies for 11-12 minutes, until edges begin to brown but the middle is still a bit gooey! Cool before serving to allow them to hold their shape. 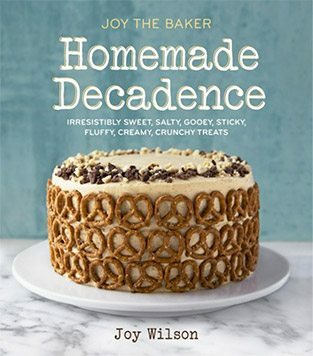 stop it, joy the baker, just stop it. I’m about to gain 10lbs just looking at these! yum! i know. it’s a problem. Oohhh my goodness. I think these might solve alll my problems. Ingredient list = my grocery list now. Amazing! These sound ridiculous. I’m currently eating a tuna salad on my lunch break, but I totally wish I was eating these instead. These cookies look delicious, I can’t wait to make them! OMG these look like the ultimate cookie!! I’ve never tried adding cream cheese to cookie dough, sounds great! Adding Oreos to anything can never turn out wrong!! awwww these look delish!!! Love the Oreo twist! I love the part where you say “Don’t taste it!” You just know there wouldn’t be any left to bake! So many mind-blowing things happening here! Cream cheese, milk powder, and cookies IN cookies! I’m in love. I’m curious if malted-milk powder would work in these as a substitute for milk powder? I am so looking forward to getting a taste of these! Oh my word! I just slid down my office chair and down to the floor….these look glorious!! OH MY GOODNESS!! These look incredible! Also, the idea of adding cream cheese to cookies thrills my heart! I’m so excited to try these! Oh joy, this just made my morning!! These cookies look unreal!! what is milk powder? Is it instant milk? Or something else? thanks – this looks soooo yummy!